The Blog of Thog: How to make a living by being a geek - honest! It's been just over two years since I started this blog up and I was very pleased today when I logged into Blogger and apparently I've hit 200,000 views, which is pretty awesome - whether it's accurate or not I'm not entirely sure, as Google Analytics tells me that the figure is actually just under 11,000, but at any rate it's all good. Thanks for reading! 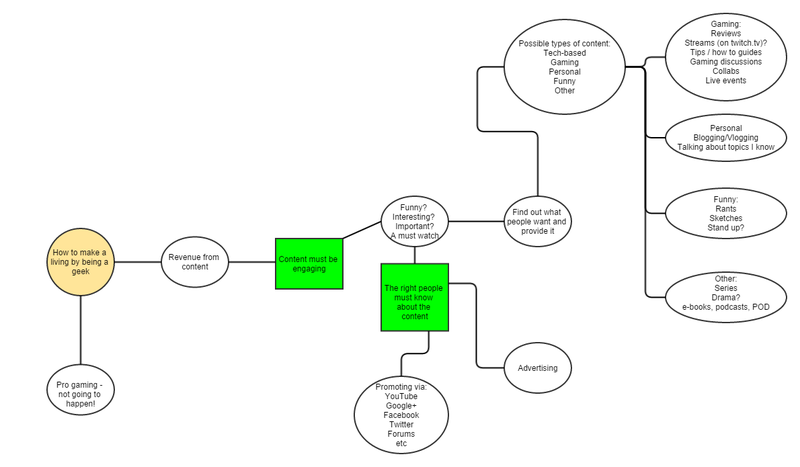 I decided to draw myself a mind map on how to make a living by being a geek. I know that there is almost certainly no way that I'll achieve this, but having a plan isn't going to hurt, and it was fun to do. The Fortune Making Mind Map that THEY don't want you to know about! Hi, I'm Mike Raven, and I used to be just like you. Then I ate a lot of food, and now I'm twice the person you are. But you can become like me too! They don't want you to know about this secret. Tired of the 9-to-5? Bored of being a rat in the the rat race? Want to be happy by earning $000s while sitting at home? 5 - Make the commitment. Quit your job. Are you having fun? Stop that. Sit at home and sweat, baby. Put the time in and the rewards will come. Learn SEO. And memes. 4 - Get out there. Network, it's not who you know, it's who the people you know know. And who they know too. Read the mind map below. But not yet - keep reading the five steps first. Do what the mind map says. Go to Eternal Bliss now! Okay, now that's over, here's the mind map. Enjoy! If you want to be a writer can I recommend this article by James Altucher that I read on Lifehacker this morning - well worth a read. Otherwise, if you enjoyed this parody of internet marketing, check out my SEO blog post from a while back, Or even a slightly more serious one about gamification. On the other hand, my most popular blog post is about being unable to locate nappies (aka diapers). So try that instead.